As I wrote yesterday, a Republican should have no trouble winning an election, special or otherwise, in South Carolina's First Congressional District (even against Elizabeth Colbert Busch, who, famous brother or not, is a political neophyte running in a red district). National Republicans are pulling the plug on Mark Sanford's suddenly besieged congressional campaign, POLITICO has learned — a potentially fatal blow to the former South Carolina governor's dramatic comeback bid. Blindsided by news that Sanford's ex-wife has accused him of trespassing and concluding he has no plausible path to victory, the National Republican Congressional Committee has decided not to spend more money on Sanford's behalf ahead of the May 7 special election. 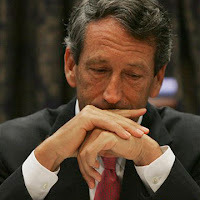 "Mark Sanford has proven he knows what it takes to win elections. At this time, the NRCC will not be engaged in this special election," said Andrea Bozek, an NRCC spokeswoman. Translation: The guy's proven to be a massive hypocrite without a shred of genuine self-awareness or humility, and we were still behind him, but enough is enough. Repeatedly trespassing in your ex-wife's house? Upsetting your own children? A Republican familiar with the NRCC's decision criticized Sanford's lackluster response to the report about his ex-wife's trespassing complaint and said it would be "foolish" for anybody to spend money on him. "It's not out of the realm of possibility for him to win – stranger things have happened in special elections," the Republican said. "But the fact that he wasted precious time and money rehabilitating his image only to squander that makes it very foolish for outside groups to commit resources." I still wouldn't rule out a Sanford win given the Republican leanings of the district, but I think it's safe to say that things are looking pretty good for Ms. Colbert Busch. It certainly helps to be running against a self-absorbed douchebag.